The Eat-In, on Wed. August 26th at Daley Plaza from 11AM to 1PM, is a free, fun, and inspiring rally in Daley Plaza in Chicago. Join us in supporting the change toward a more effective reauthorization of the Child Nutrition Act. Bring you own lunch or visit one of our participating providers to pick up your Slow lunch and join the table with: Chicago’s own Bill Kurtis and Commissioner Mary Ellen Caron, city and state legislators, local farmers & purveyors, and partner organizations. Contact your legislator & sign the petition. 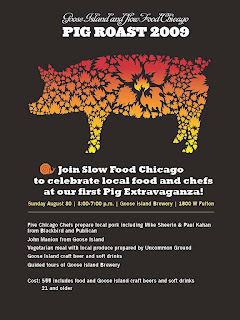 Slow Food Chicago and Goose Island Brewery are teaming up for our first Pig Extravaganza, a fundraiser for Slow Food Chicago. Join the party on Sunday, August 30th from 3-7pm. Five celebrity chefs including Mike Sheerin and Paul Kahan of Blackbird and Publican will prepare delicious local pork and local produce. A vegetarian entrée by Uncommon Ground will be made with harvest from their organic rooftop garden. Goose Island craft beer and craft sodas are included. There will be tours of the brewery and music too! Join the volunteer committee. You'll have a lot of fun and receive free admission!!! For $25, you'll indulge in some truly extraordinary and some never-before-tasted ice cream creations. It promises to be a Labor Day weekend that's sure to take the cake. • The Great Chicago Brain Freeze - a delicious chef competition where you get the chance to vote for the winners and taste the results. Grab a spoon and bring your bowl mate!